Temperament: Intelligent, friendly, and devoted. Very active and needs daily exercise. Sheds seasonally and needs occasional grooming. The Golden Retriever was developed in Scotland around 1850 in order to create a specialist retriever that was capable of retrieving over rough terrain. Indigenous retrievers at the time were crossed to a tweed water spaniel (now extinct) for the original cross then to other breeds such as Irish Setters, sandy-colored Bloodhounds, the St. John's water dog of Newfoundland, and wavy-coated black retrievers. The progeny of these breedings were then inbred to set the breed type and consistency. The Golden Retriever was recognized by the American Kennel Club in 1925 and the breed was first registered in Canada in 1927. Currently Golden Retrievers fill a diverse role worldwide from seeing eye dogs to search and rescue. 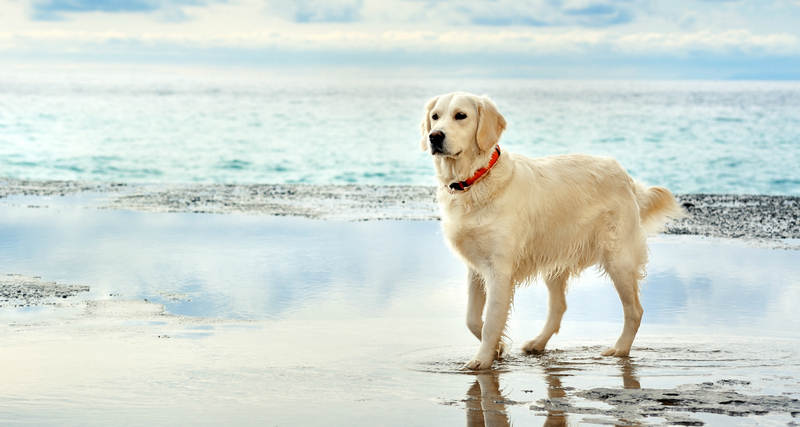 One of the most prevalent issues in Golden Retrievers appears to be cancer at a young age. This is indicative of derailment of the immune system. Analysis of Golden Retrievers shows the majority are clustered in one area genetically, however there is the presence of genetic outliers. Breeders could seek out genetic outliers to redistribute their genetic diversity. Internal relatedness (inbreeding) comparison to village dogs showed loss in diversity from village dog ancestors, however not as much as some other breeds that have been thus far investigated. Golden retrievers have 3.462 effective alleles (alleles most represented) versus an overall average amount of alleles of 7.455. The overall average number of alleles indicates Golden Retriever Breeders could work to redistribute their rare alleles to maintain the diversity they still have within the breed. 20 different STR-associated DLA Class I and 19 DLA Class II (Table 6) haplotypes were found among 226 Golden Retrievers tested. DLA class I haplotypes 1066, 1069 and 1071, and class II haplotypes 2045, 2046, 2047, 2048, 2049, 2050 are unique to Golden Retrievers among the breeds that have been tested to this time. Only 44% of the DLA types contribute to most of the diversity. Golden Retrievers have a decent amount of genetic diversity maintained but should strive to redistribute the diversity they have among the population. By doing so, this may help decrease complex genetic disorders. This is achieved by breeding for greater than average OI (.26) and less the average AGR (-.01). Also, seek for an IR below breed average (.01) as this will reduce in incidence recessive component diseases. In terms of DLA, select for two different types at each locus, to create a diverse immune system, paying particular attention to the uncommon DLA to increase them in the population.